^ Aix sponsa. IUCN Red List of Threatened Species 2014.3. International Union for Conservation of Nature. 2012 [1 December 2014]. ^ Dawson, William. Neher, Anna, 编. Dawson's Avian Kingdom Selected Writings. California Legacy. 2007: 37–38. ISBN 978-1-59714-062-1. 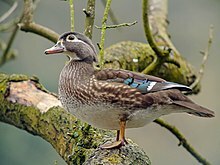 ^ Wood Duck (Aix sponsa) (PDF). USDA Natural Resources Conservation Service. [9 July 2010].